We have had quite the busy season on Kickstarter so far, and we still have a little while more to go! Here are some updates that our beloved backers have received recently – there’s a bit about Crisis and a lot about Diesel Demolition Derby, our ongoing campaign! It’s been a while, and we wanted to update you on what is going on with Crisis, and its ever expanding world. First, we have been in contact with publishers around the world to try to get the game a retail release. It’s a tough one, with a game that is so expensive to make. But we are trying. Second, in about a month we will be meeting up with the designers to see how the expansion material is coming along. By that time we will have put up an online form that you can fill in, if you would like to help us playtest it, ahead of a campaign next year. Third, well, we are happy to announce that the world of Crisis is growing! We were hesitant to even call it a “world” until now, but this happening a third time shows that we have something here. 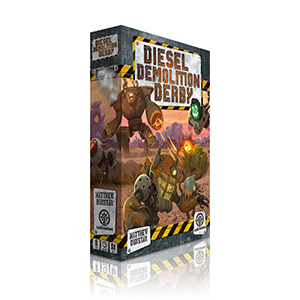 Ladies, gentlemen and sentient robots, allow us to introduce the campaign for..
Diesel Demolition Derby is a brilliant tactical drafting game by the esteemed Matthew Dunstan, whose design work you can experience in Elysium, Relic Runners, Costa Rica, and many more great games. 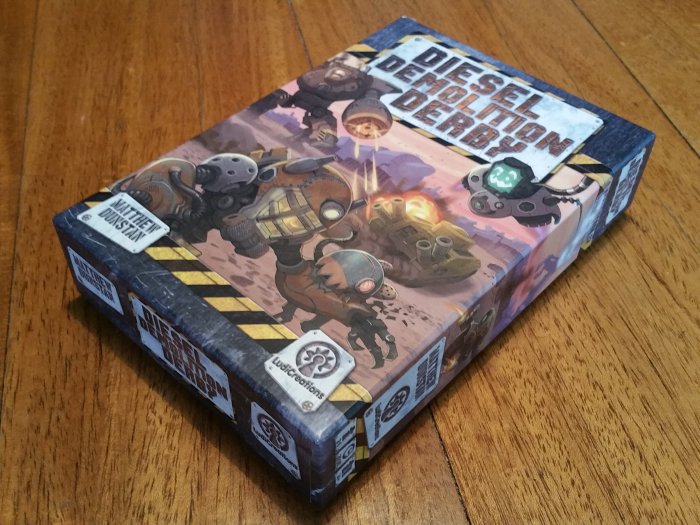 Matthew pitched this game to us a while ago, while we were in the planning stages for the Crisis campaign, and as soon as Anthony was done with illustrating the dieselpunk edition of Long Live The Queen, we immediately asked him to work on Diesel Demolition Derby. Matthew’s take on the card drafting genre is a bit more interactive than you might be used to, still without being mean. However, it still remains a simple game to learn, since the symbols and exceptions have been kept to a bare minimum. 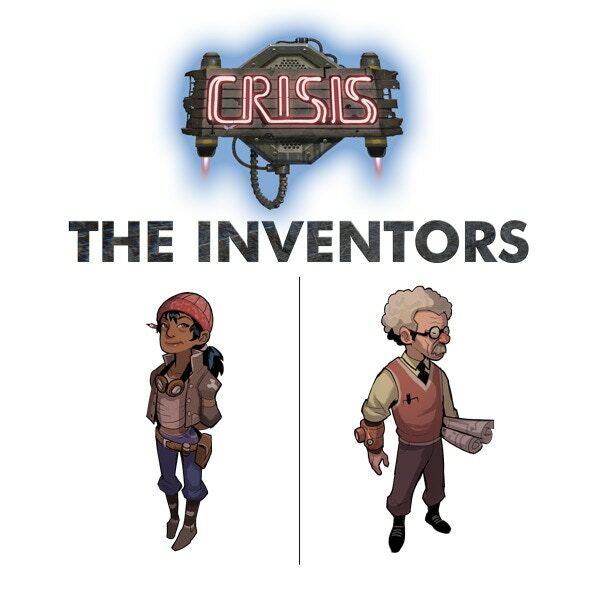 The Inventors is a set of two promo tiles for Crisis included in every copy of Diesel Demolition Derby. Each of the two Inventors is an Engineer employee (+1 modifier) that is moonlighting as a Battlemekk designer for Axia’s underground Diesel Demolition Derby league. They have the ability to command their robotic creations to do their bidding and will not hesitate to do so. At the moment the Inventors are part of the Diesel Demolition Campaign, but in the future we may be able to offer them separately, e.g. for a nominal $5 cost, or at conventions such as Spiel. We hope to be bringing you more good news soon. We know how really fortunate we are to have had your support in making Crisis, and we hope to have it in the future as well! 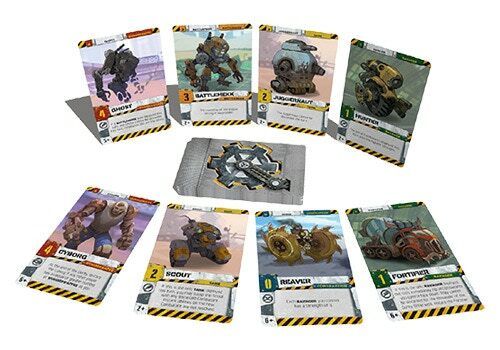 It seems that the world was ready for a dieselpunk-themed mecha combat card-drafting card game, and it also seems that we are in the right place at the right time. So, thank you for helping us write the next chapter in the saga of the Crisis universe! Along with Matthew’s game design and Anthony’s art we are very fortunate to work with a great team to bring you this fun romp through Axia’s diesel-powered underground high-stakes demolition derby league! Next on the agenda is implementing pre-production plan, and we will definitely be asking for your help in a final proofreading of the rulebook. Matthew will also have a designer diary for you, and we are also working on getting you photos of the latest sample of the Deluxe edition’s metal gears. Furthermore, Rahdo has raised some interesting points for the 2p game, and so Matthew is working on a variant that will allow players the chance to use all of the cards in the game, regardless of player count. More to come in a future update. Until then, stay tuned. And, please accept our gratitude once again. Without you there would be no game such as this – indie publishers without established distribution such ourselves only exist because of you! We have revamped the rulebook, and we are now at the final proofreading stage, which is where you come in! We would like to send this off to the printer already next week, so please send us your feedback as soon as you can! There will be an update on individual components, and we are also going to be posting a short designer diary written by Matthew! Until then, many thanks for reading this far!